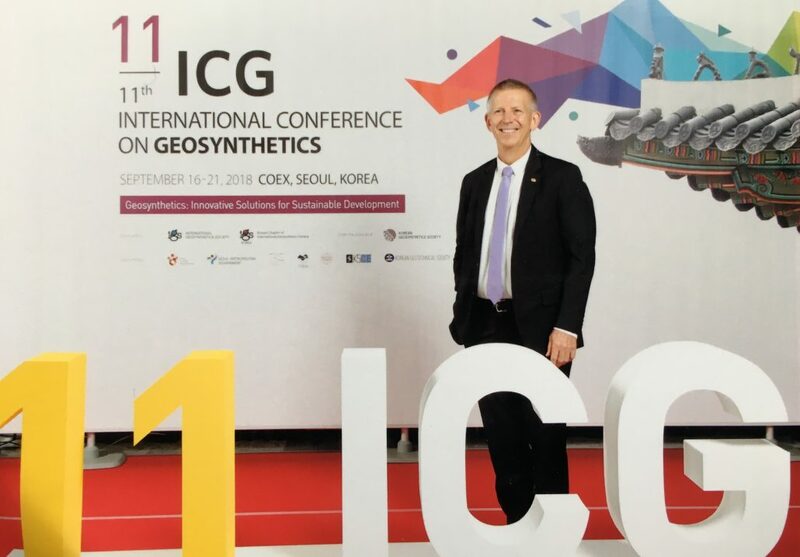 Boyd Ramsey attended the 11th International Congress on Geosynthetic held in Seoul, Korea in September. The international conference, held every four years, was very well attended and also very busy. 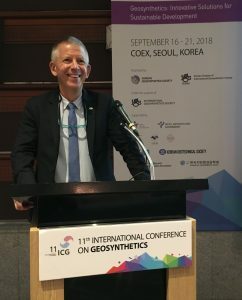 In addition to the IGS Council meetings, Boyd presented two papers and chaired a technical session and the IGS Technical Committee on Barriers meeting. At the IGS General Assembly, Boyd was re-elected to Chair the IGS Finance Committee. The two papers were titled: “New technique for predictive geomembrane stress crack performance: Commercial application” which was co-authored with Helmut Zanzinger and Ed Zimmel and “Developments and guidance in global geosynthetic specification and regulations” co-authored with Stephen Corbett. The former introduced strain hardening as a technique to predict stress cracking performance of polyethylene geomembranes and reported on a commercial scale evaluation. The Specifications paper was a version of a document created at the request of the IGS Education Committee and identifies good specification practices and further, supplies examples of useful existing specification documents. Both papers can be found in the publications list on this website or in the event proceedings.